Well, well…speaking of doves; guess what I spied in the grass this morning? 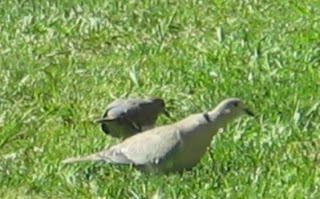 Yup, another White-winged Dove…the bird in the back with the white edges along the curve of its folded wing. Okay, very fast shot and through the window and some 60' away, to boot; but you can see it's what it is. Sweet! This dove, like the one before, seems to hang with the Eurasian Collared Doves...which is, of course, why I suppose it's lonesome! 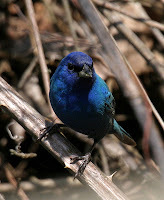 Also saw another Indigo Bunting today…but the several dozen cow-birds which showed up scared it off. Lordy, I do NOT like those cow-birds. To tell the truth, I'm thinking the bird was a hybrid...an Indigo/Lazuli cross. 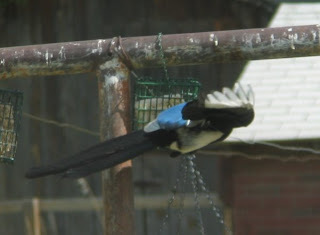 The intense blue bird had white wing-bars but it lacked the rufus breast-band but it had a white belly. I understand these two inter-breed where they overlap territories. Still...a stunning bird. No, not the rare and difficult to find “Bob-tailed Grackle”…just a bird who probably thanks his lucky feathers all he lost was a tail! How humiliating…at first I thought I saw a light-eyed starling when I walked by the window. He seems to fly okay, but I hope he doesn’t have any migrating to do soon. A missing tail can’t be a good thing during long trips. I wonder if it will grow back. On a lighter note, while Black-headed Grosbeaks continue to visit, they're here in fewer numbers. The Evening Grosbeaks are still here in droves. Several many Bullock’s Orioles still visit regularly; I’m thinking drilling out half the ports in all the hummingbird feeders was a great idea! Well…and keeping the grape-jelly station well-stocked; those guys love their jelly! 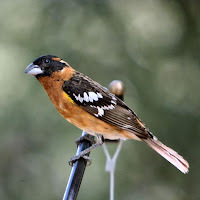 Who knew the Black-headed Grosbeaks occasionally indulge? I still see lots of brilliant finches, including the occasional Lesser Goldfinch and Lazuli Bunting…but this time of year it seems most are not relying on feeding stations. Having said that, the Pine Siskins are bringing their newly fledged youngsters here...probably greatly relieved to get a break in 'on-demand feeding'. Ha...the babies still demand and resort to begging. They'll learn. 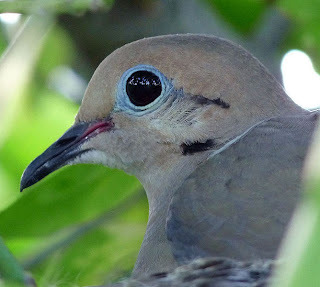 What I am happy about is that while they’re still around, the Eurasian Collared Doves are not here in the great numbers they were…and have allowed the much smaller Mourning Doves to visit more often. The last few mornings I’ve seen as many as four at a time picking through the chicken scratch I toss in my yard. They make me smile. Have you ever seen one up close? This morning I missed the peeping calls of Evening Grosbeaks. It’s raining here, perhaps they’ll come around later; they don’t seem to get along well with their cousins, the Black-headed Grosbeaks…who are here in droves right now. They’re even up on the feeders very close to the house, which are usually dominated by the Evening bunch. Apparently, when they’re around…they’re the bosses. 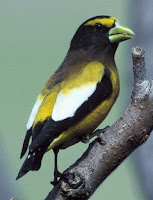 Yesterday, while watching the Evening Grosbeaks feed just a foot or two from my nose, I noticed some of the males, perhaps the most dominant ones, occasionally raise the feathers on the tops of their heads. They looked like spiky, brown-headed punkers with oddly penciled yellow eyebrows. The normally smooth, yellow brows, when ruffed-up in a macho display, show as a row of single, yellow slashes above their eyes; a fairly significant ‘scary-face’ on a normally sweetly-behaved and congenial bird. 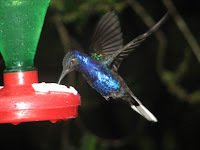 I just love the beautiful blue-green their bills become during breeding season. Also here is the single remaining Red-winged Blackbird. While several weeks ago the blackbirds were here nearly by the hundreds, they have mostly left; only the single male seems to remain. In their place, sadly, are literally dozens of Brown-headed Cowbirds. It is eerie to watch them fill up tens of feet of phone-wire over my yard, not really reminiscent of Hitchcock as some other brand of horror movie. I’m sorry, for as pretty a bird as a Cowbird is (and they are), in my mind they are just evil incarnate. Ugh, it galls me no end I have so many (40-50) hanging around my feeders. On to a sweeter note, I also observed a tiny finch, the Lazuli Bunting here…as well as a male Lesser Goldfinch. This black-backed variety looked even slicker, due to the gentle drizzle that’s been falling all morning. Yeah, another wonderful day in the neighborhood! Learn What to Look For! This morning, still wet from the heavy rains yesterday and last night, I saw what I believe to be a female Calliope Hummingbird. Of course, I really don’t know, but I’ve had them here earlier…or so some commotion a May 4th posting caused makes me think. At any rate, when I came home last night, I was amazed to see so many birds at the feeders; it was after 5:30 and still raining. The birds were feeding hard…and were slick; dark with thoroughly wet feathers. I kept thinking I hope it doesn’t get too cold tonight! To help things along, I checked feeders it made sense to re-fill and made sure all the nectar feeders had enough to make it through to the early morning; and added a couple fresh suet cakes. Back to the hummingbird; one of the things I thoroughly believe in is reading field guides and other books on local birds. One needs to know what one might see around here…and when, too. I do this, and while I suppose it might cause me to see things that are not there…like wanting a certain hawk to be a Ferruginous Hawk; I don’t like to say it’s so unless I’m certain. 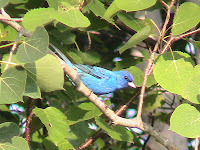 But, like seeing a smear of intense blue amongst the Lazuli Buntings, some ‘sightings’ prepare me for reality; a couple days later I got a long, clear look at an Indigo Bunting. 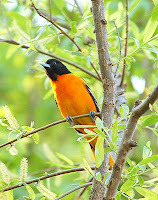 Or like the other day when I noticed a ‘black-headed oriole’….I was prepared to consider either an Orchard or a Baltimore Oriole when I got a much better look later in the day. So, this morning while I watched the birds and I noticed a single and very hungry female hummingbird at the feeder, sitting for quite a long time, I considered the fact that she practically had no tail. In fact, she had the ‘stubby cigar’ shape experts describe as a Calliope Hummingbird …with a sort of humped back I associate with the breed. 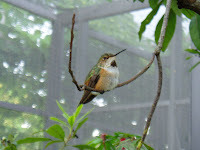 Unfortunately, I’m not an expert birder and can’t tell female hummers one from another; but this one sure was stubby! It could be she just arrived (though males usually arrive first) and was exhausted; it could be ‘she’ is a young male, and it could be she was just all puffed up because she was cold. I don’t know, but I got to watch here for quite awhile…even as others buzzed around her; back and forth from the feeders. I think I was watching the first of hummingbird variety number three: the Calliope Hummingbird…but I won’t know for sure till I see the males. They’re coming and I’ll be ready to identify them when they get here. I lifted the second photo from www.MaxWaugh.com to show the stubby, ‘cigar-shape’ look that make Calliope’s unique. Please visit his site for the full-size image. The other image is from Wikipedia. 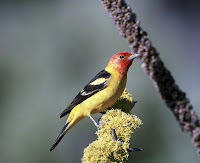 About bird watching, though...this morning I think I saw the first Western Tanager of the season...always a treat! I spent a good amount of time mowing this morning...so the birds are somewhat skittish. Saw no Rose-breasted beauties, but the Black-headed and Evening Grosbeaks abound. This Tanager enjoys the oranges and grape jelly I put out...as well as home-made suit. 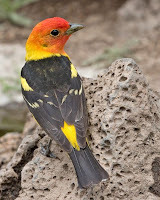 I've done a bit of research and have some of my own photos; read some facinating information about the red on this red-headed bird on a previous post here. 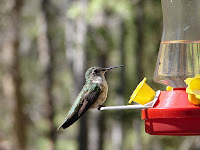 Hummers are here in increasing numbers; still have yet to see a Rufus or a Calliope, though. It is a bit early, me thinks. It is no wonder they sometimes cross-breed with Lazuli Buntings; they are nearly the same size (Indigo is a tiny bit smaller) as their cousins and have the same, smudgy, dark-eyes. Clearly they have similar backgrounds. This one is all-over blue; darker than a new pair of good Levis...with a hint of black on the wingtips. Before the day was done, I also found a black-headed Bullock’s Oriole; but, of course, there is no such bird. This pretty boy was drinking from the nectar feeders at my kitchen window. I watched the bird for quite some time…about 2’ from my nose. 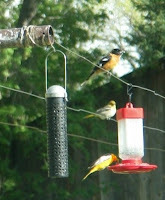 However, upon some research, I discovered what I saw was a Baltimore Oriole! Another first! Doing the research, I tried to figure out how the heck to tell a Baltimore from an Orchard Oriole…assuming one is not familiar with “distinctive dark chestnut” color. Well, most of it is in the tail; the Orchard Oriole has a dark tail, while the bird I saw had an under tail the same brilliant yellow-orange as his belly; so it was surely a Baltimore Oriole! Sweet!!! 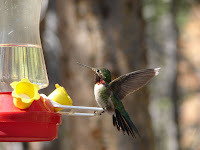 Who doesn't like to feed hummingbirds? Have you ever found a big bird at your humming bird feeders? Orioles also enjoy nectar…though sometimes a less ‘rich’ blend like 5/1 or even 6/1. 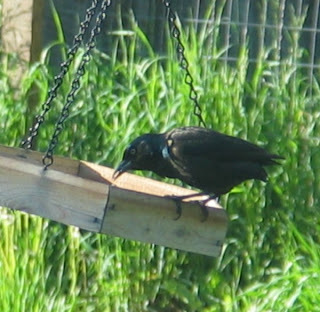 I drill out some of the holes on the plastic ‘pan’ feeders (which have perches these birds need to feed from the feeder; they don’t ‘hover’) I use for the hummers and let them feed on the same stuff the hummingbirds enjoy. They always do. 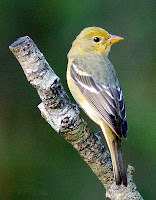 Course, I also offer orange slices and halves, as well as grape jelly (which also bring in the Tanagers). Granulated Sugar is made from either of two plants: sugar cane or sugar beets. There is no real difference in the sugar made from these plants; some manufactures don’t even mention which is used. The sucrose in each is the same, but trace elements are different; but have insignificant nutritional effects. Regular sugar = fine granulated sugar = table sugar = standard granulated sugar = extra-fine granulated sugar is the standard table sugar we're all familiar with. "White" sugar is created in a couple of ways. Beet sugar is produced much the same way as cane sugar. The beets are sliced and soaked with chemicals to form a sugary syrup. Sugar cane is initially pressed and the juice is then mixed with lime to achieve the desired PH-balance and to help settle out impurities. The liquid, now a dark grayish-green color, is heated to its boiling point, and chemicals are added to remove impurities. Sulphur dioxide is introduced to the cane juice before evaporation. It effectively bleaches the mixture. Next, the juice is placed in huge tanks to evaporate, leaving a thick syrup. This syrup is heated to remove more and more water until crystals form. These crystals must be separated from the syrup, so they are put into a centrifuge machine which spins it around rapidly. The sugar which is left inside the machine's cylinders is called raw sugar. In this form, the sugar has uses to some manufacturers, but to make it suitable for food, it must go to a refinery. There, it is dissolved, treated with chemicals, filtered, crystallized once more, and allowed to solidify, this time into pure white sugar. Brown sugar is refined white sugar with a molasses-syrup mixed in and then dried again. 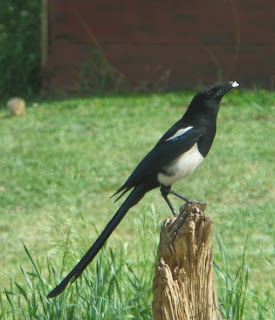 About making nectar to feed birds; do not use commercially prepared liquids or mixes. They contain preservatives that are even more harmful to birds than to humans (it’s a size thing), as well as various dyes which have also been proven harmful as well. 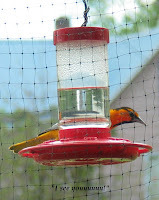 Let the feeder itself provide the color (red attracts hummingbirds (and orioles, to), but yellow is favored by bees and wasps. 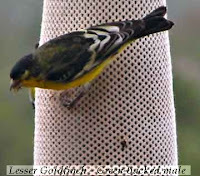 I always remove the yellow ‘flowers’ when I find ‘em on feeders. Do not use brown sugar, confectioner’s sugar, raw sugar, or turbinado sugar to make your nectar. Confectioner’s sugar contains corn starch that can cause the syrup to ferment quickly. Brown sugar and raw sugars contain iron and can prove deadly to hummingbirds over a period of time. Do not use artificial sugar if only because it contains absolutely no nutritional value (not to mention what it does contain). Do not use honey to prepare your mixture. Honey will ferment more quickly and also promotes the growth of fungus and other organisms that attack the digestive system of the small birds. Oh, another goodie I learned from the hummingbird book Bosque Bill suggested (by Dan True; see Bill’s Place): Place pieces of fruit that attract fruit flies and gnats near a feeder (bananas, peaches, apricots, etc). I’ve watched hummers hawking gnats swarming over grass and understand they eat tiny spiders and other bugs deep within evergreens; but the fruit attracts the tiny bugs to eye-level, where you can watch …and the hummers will thank you for the extra protein! One last consideration: the 4/1 ratio is sort of a generalization. Plants naturally contain higher and lower ratios of sugar to water; depending on weather, water, etc. When birds first arrive during migration, they might enjoy a higher level of sugar to water; it will certainly keep the birds coming back when they’re nearly starving. However, keep in mind that nectar is where the birds get water, so too rich a mixture will do more harm than good as the weather gets warmer and everything needs to drink more water. There have been some studies regarding whether or not too rich a blend damages birds’ livers, too. Perhaps a slightly richer ratio very early in the season would be beneficial, but certainly not for the long run; cut back to 4-to-1 before summer gets rolling. That said, by and large a bird knows what it needs. Rich food makes for fewer visits to feeders; a more natural concoction will allow them the time to rest and/or feed on other foods.